Dr. Gail Holst-Warhaft, gave the 2015-2016 Kimon Friar lecture on the influence of the refugees from Asia Minor on modern Greek music, specifically in the genre of rembetika. 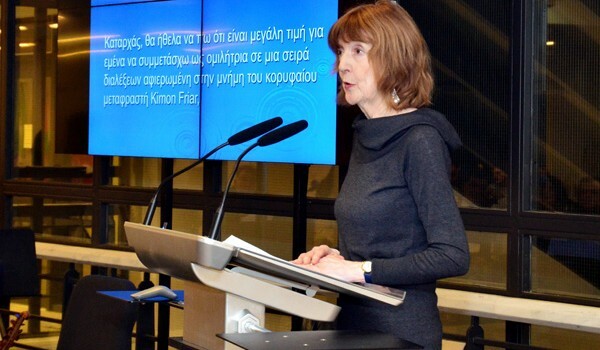 It was a great honor for The American College of Greece to present Dr. Gail Holst-Warhaft, Adjunct Professor at Cornell University, as the 21st Kimon Friar Lecturer. The annual Kimon Friar took place on Monday, December 7. 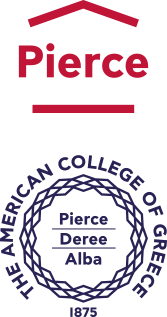 The series of lectures is named after the Greek-American poet and translator Kimon Friar, who bequeathed a large portion of his archives to ACG. According to Dr. Thomas, Dean of the Frances Rich School of Fine and Performing Arts, who delivered the lecture’s opening remarks, Kimon Friar was born on the little island of Imrali – Kalolimno in Asia Minor and, although he moved to the US a few years before the Christian population was forced out, his roots meant a lot to him. This year’s lecture was of particular importance to our institution as well, as it was held in the context of celebrating 140 years since the College’s foundation in 1875 in Smyrna by missionaries from Boston, Massachusetts. Fleeing the destruction of Smyrna, much like an ‘educational refugee’, the College reestablished itself in Athens in 1923 where it evolved into a significant educational organization, interwoven with Greece’s cultural heritage. The lecture, entitled “They Drove Me out of Smyrna: The Asia Minor Refugees and Their Influence on Modern Greek Music” focused on the issue of intercultural interactions and relations The Kimon Friar Lecturer took the audience on a musical journey of the amanedes and minores, the bitter nostalgic dirges of the people of Smyrna. As Angeliki Maroniti Papazoglou, a popular singer of the time said, “We never got tired of the minores, because through them we expressed our pain for our slavery.” Following the Smyrna catastrophe in 1922, and the exchange of populations which brought a million refugees to Greece, those same melancholic melodies were sung in lament for their lost homeland, communicating a sense of human pain and loss. The lecturer reflected on the limits of human charity, as an initial wave of sympathy towards the incoming refugees was replaced by resentment and suspicion. According to the autobiography of renowned musician Markos Vamvakaris, he described the prejudice against the refugees as a “catastrophe” saying, “may our eyes never see such a thing again…” However, Dr. Holst-Warhaft said, “Greek artists were exceptionally sympathetic to refugees,” as they knew they were hard-working people who brought along their music, and as Vamvakaris said, “our musicians learned to play from them.” The distinguished professor also referenced similar situations in the 30s, such as in Chicago and Seville, where immigrants and locals sang together, creating new hybrid musical styles. Shortly after the lecture, a live music performance took place which traveled us all back in time. Celebrated musician, Haig Yazdjian and his band, were joined by Tatiana Papageorgiou, and a wonderful reception followed. During the 70s, while researching a book on Greek music, Dr. Holst-Warhaft also performed as a keyboard-player with some of Greece’s leading composers, including Mikis Theodorakis. Among her many publications are: Road to Rembetika (1975), the most popular book in the English language on this genre, which is now in its 5th edition, Dangerous Voices: Women’s Laments and Greek Literature (1992), The Cue for Passion: Grief and its Political Uses (2000) and Water Scarcity, Security and Democracy: A Mediterranean Mosaic (2014). She has also published translations of Aeschylus, and of Greek poets and writers including Iakovos Kambanellis and Alki Zei. Her poems, articles and translations of Greek poetry have appeared in many journals in the US, the U.K., Australia, and Greece, and was Poet Laureate of Tompkins County for 2011 and 2012. We greatly look forward to her new volume of poetry and prose about Greece, The Fall of Athens, forthcoming with Fomite Press. For more information on Dr. Holst-Warhaft and her publications, please click here.